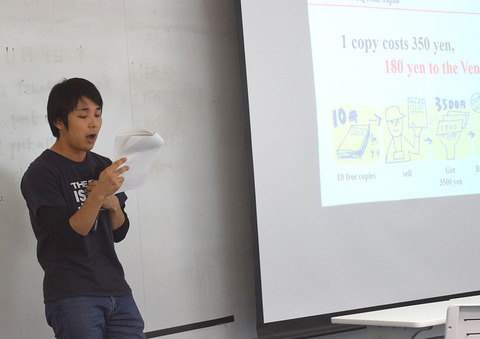 At the first, I will introduce the basic information and the concept of the Big Issue Japan. The Big Issue Japan is a magazine sold by homeless people on the street. And it started in 2003 in Osaka…. Vendors buy the Big Issue magazine for 170 yen and sell it for 350 yen. For every copy, the vendors sell, they earn 180 yen . At first, a homeless person has to registers with us to become a vendor. Because he/she usually does not have money at the beging, we give the person 10 free copies. When the vendor sells all 10 copies, he/she will have 3,500 yen to buy more. Here in Japan, there are about 110 vendors from Hokkaido to Kyushu. In Osaka, about 45 vendors are selling magazines, for example, near Umeda station, Hotarugaike station, Toyonaka station, Senri-chuo station and so on. So far, more than 1,700 people have sold magazines and Vendors have earned about one point two billion yen in 14 years. 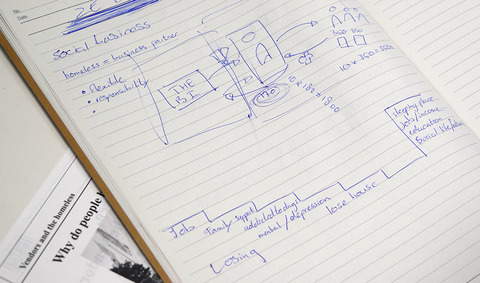 Why does The Big Issue Japan focus on that the homeless are business partners? 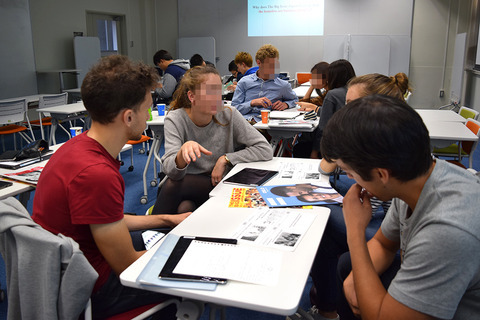 The students discuss about the Big Issue model in groups. 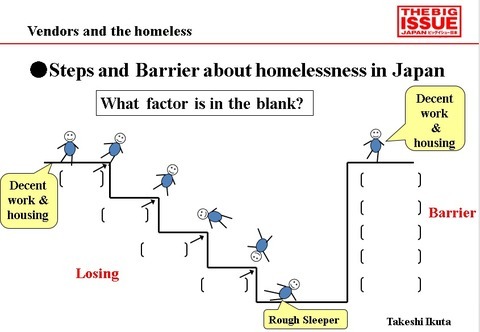 What is the step and barrier about homelessness in Japan? 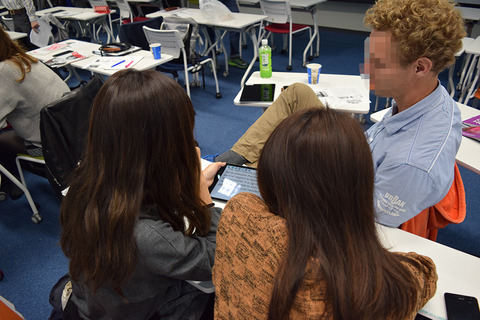 Next, the students are asked to discuss why a person become homeless in Japan. 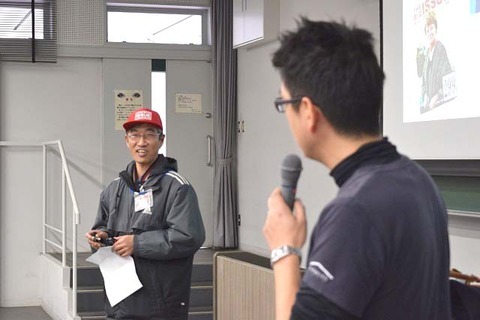 The vendor of THE BIG ISSUE JAPAN talked to the students about his life. When I became a vonder, I wasn't really sure if anyone would buy the magazine. I thought it's really thin. However, within one hour I started, one copy was sold. So I thought it was good and decided to give a try. As I continued this job, I started getting more and more customers and a lot of regular customers too. 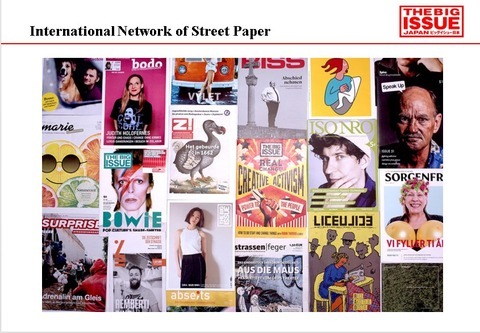 In order to get new customers on the street, I started say things like “The Big Issue now on sale! The Big Issue now on sale!”. Now I have got regular income, I can afford to eat what I want while not to sleep on the street. I have come a long way since I first started selling. For example, I am able to have accommodation to sleep safely, and have three meals per day. Moreover, I am even able to play football in the program provided by The Big Issue Foundation and I am able to talk about my experience in front of the group of people like today. I have good relationships with other vendors and they often help me. I think my life has really changed for the better, from being a lonely homeless person. At the beginning, I thought that shouting“The Big Issue now on sale!” felt almost like crying for help to the people. However, my customers motivated me to make challenge and live my positive life. Now I am proud of my job,and through vending The Big Issue magazine on the street or talking to the people who is willing to listen, I want to convey the message that homelessness is the social issue. Be positive. My heart is always positive. Life is hard, life is painful. I'm heart break, no problem. But I can find happiness. So everyone, keep on smiling and never give up.Arigatou.